Ch Xeneran Finat Cut "Hugo" x Ch Skara Braes Dream Street Rose "Rosie"
Summer of 2018 Kendrew and I headed down to the Greeley CO. Specialties. Kendrew strutted his stuff, picking up back to back 5 point majors, leaving him sitting on 14 points. Kendrew's first major was at the Pacific Northwest at the Timberland cluster. This left me in a quandry, do I go to the shows in New Mexico to see if I could get that last single point or do I hold out and wait for the National in Tuscon. After giving it a great deal of thought I entered the GSCA Specialties in NM. Again Kendrew did me proud picking up another 5 point major to finish his AKC title. He was in with the big guns at the National, but I couldn't be prouder of this two year old making the cut at the National. Kendrew has done so much in his short life and we are having a blast. He is currently sitting #5 Gordon in Canada with very limited showing and #1 owner handled in Canada. This spring Kendrew and I tried something that I had never done before. We ran in three field trials. It was a wonderful experience for us both. Our first trial we came away with a Certificate of Merit in the Open Puppy stakes, the second trial a 4th in Open Puppy and the third trial a third in Open puppy. Kendrew placed Number 9 Open puppy for 2017. 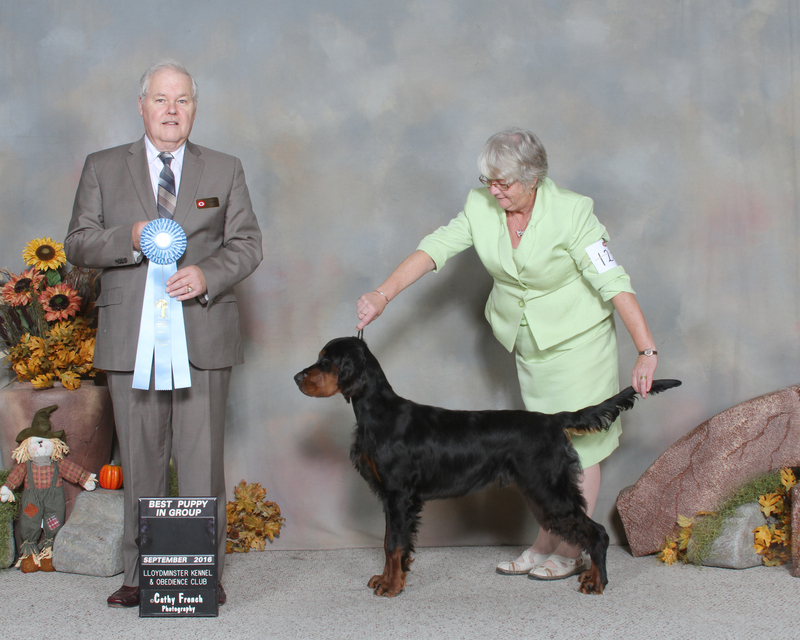 We have also attended a few all breed shows where Kendrew has picked up breed wins and is now only six points shy of his Grand Championship. 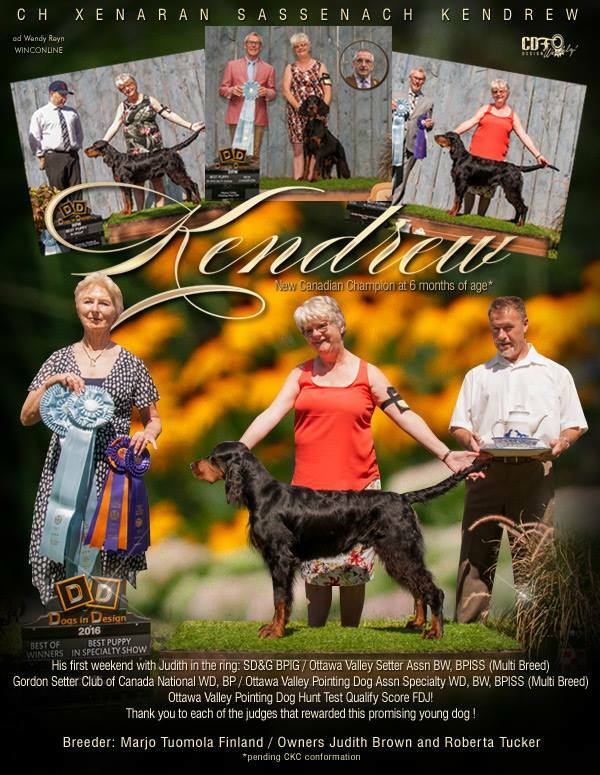 Kendrew finished his Grand Champion title in January 2018. 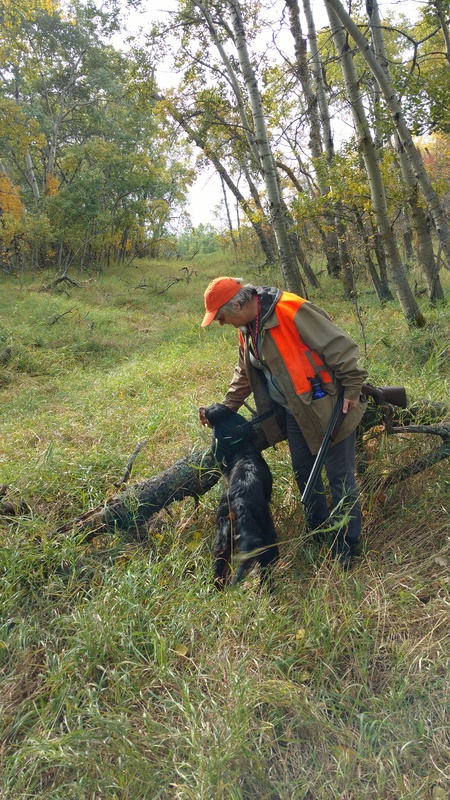 Kendrew can now add Field Dog Junior title to his accomplishments, going three for three in the tests with his natural instinct kicking in. Kendrew has a great nose and now that he's run in the field a few times he's having Ah Ha moments and a natural point is appearing. This fall will see us out in the field as much as possible for Kendrew to hone his skills before we add in more formal training. 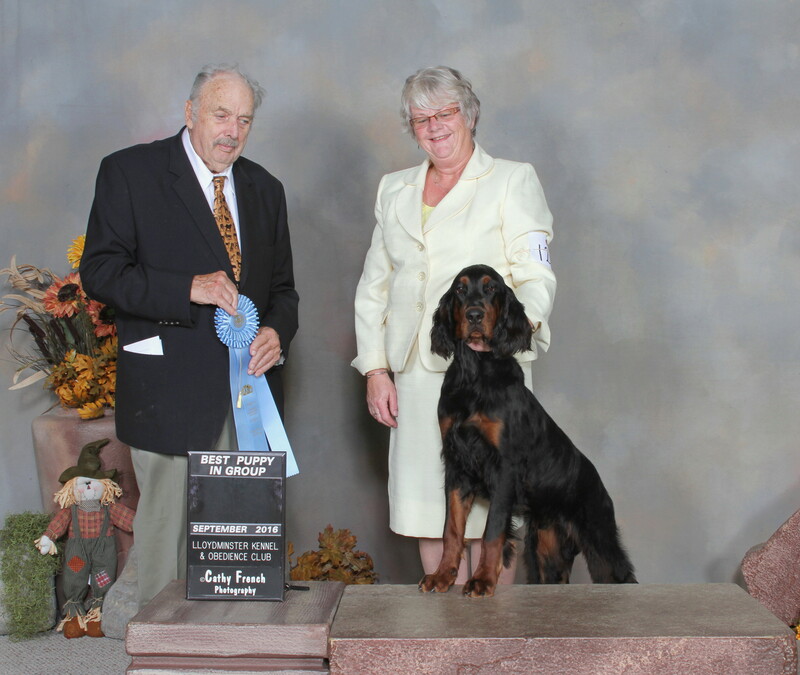 Pending CKC confirmation Kendrew finished his Canadian championship with Specialty wins at six months of age. Kendrew and I made our ring debut together in the SD&G Dog shows in Long Sault, Ontario. Kendrew had been with his co-owner Bobbie and his sister Dolly since May. Bobbie had Drew out to classes and social events etc. I was the lucky one that got to take him in the ring and play. Thinking it would be a nice relaxing set of shows with no pressure on a six month old baby, I was wrong, this young man was a contender from the get go. The first show he was RWD and Best Puppy in Group. The next two day were specialty shows. At the Ottawa Valley All Setter Association he took Best of Winners, Best Puppy in Breed and Best Overall Puppy in Specialty. 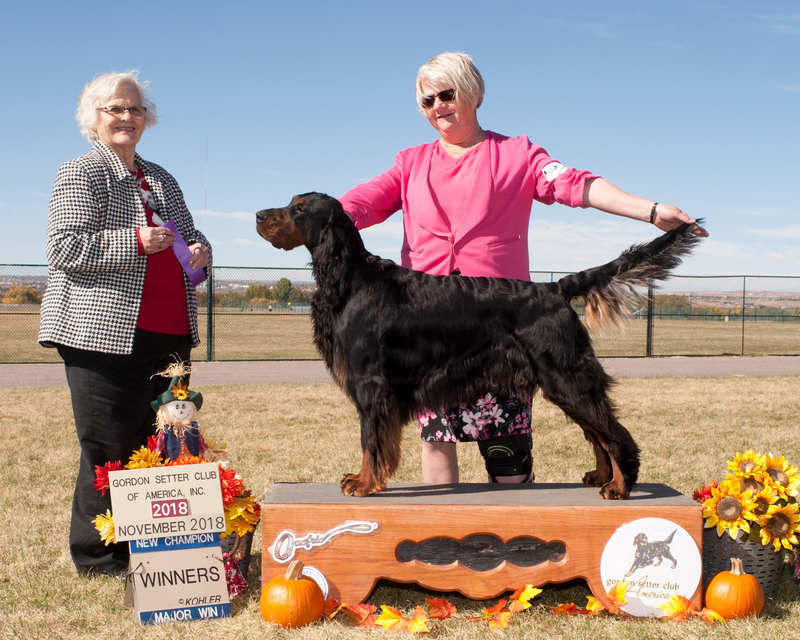 The next show was the Gordon Setter Club of Canada National Specialty where he went Winners Dog and Best Puppy in Specialty. 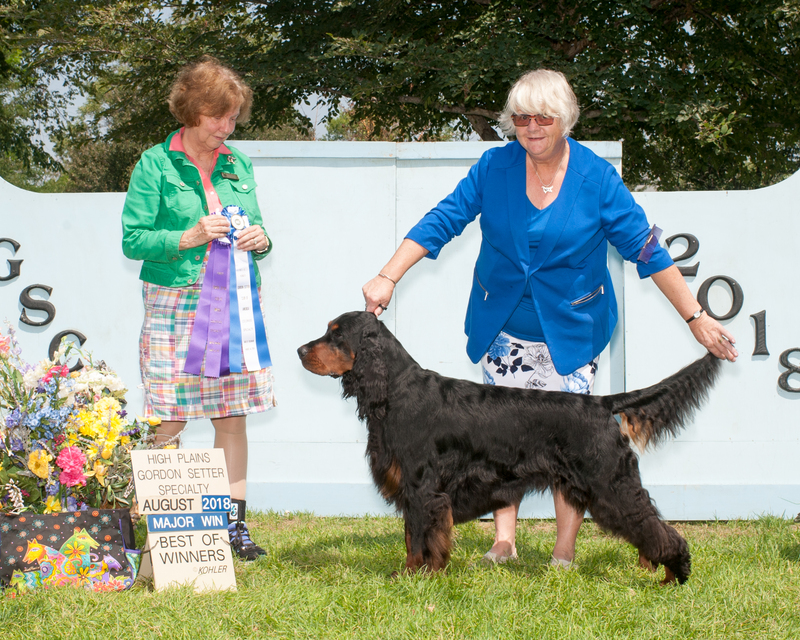 Sunday saw us in the ring for the Ottawa Valley Pointing Dog Specialty, here he took Best of Winner, Best Puppy in Breed and Best Overall Puppy in Specialty, finishing his title. Kendrew was also entered OVPDC Field test and although it wasn't spectacular he did have a qualifying run on his FDJ.